In 2013 the World Tourism Organization reported that more than one billion international overnight tourist trips occurred globally during the previous year. Aside from the impressive number, the achievement was even more remarkable given the lingering effects of the global financial crisis. It is proof indeed of the tourism sector's great resilience, as well as the continuing explosive growth of mass tourism markets in China and other parts of Asia. Tourism Management, 5th Edition explains why sophisticated and adaptive management is required to realise the tourism sector's full potential as a positive and sustainable economic, ecological, social and cultural force. This new 5th Edition continues to equip aspiring managers and planners with the broad cutting-edge knowledge and mindset conducive to resilience and innovation in the tourism sector. It emphasises the paramount importance of sustainability in terms of the 'triple bottom line' by concurrently acknowledging the legitimacy of economic, environmental and sociocultural viability. Such holistic thinking needs to be deeply embedded in the deliberations of all tourism planners and managers. Special features in each chapter also continue to highlight how innovative technologies can be utilised in the interests of resilient and sustainable tourism. Social media, for example, has attained a degree of importance as a democratic marketing vehicle that could not have been foreseen even a few short years ago. 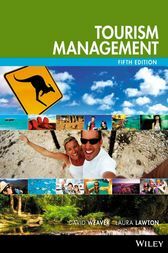 Tourism Management, 5th Edition builds on its long-held reputation for providing students with a strong pedagogical application of the economic, sociocultural and environment impacts of tourism. The title's twelve chapters constitute a logical introduction to the tourism sector aligning with a typical university semester. It prepares students with exposure to the latest industry and research developments, in turn building their capacity as the successful tourism managers of the future.